This plan relies on features of a browser addon called FrankerFaceZ or FFZ. It didn’t seem to get much fanfare, but apparently, sometime back in late 2018 FFZ re-introduced “Artificial Chat Delay” feature — which is the trick. The feature had been known and existed before, but the capability was lost/disappeared after Twitch had made a major website overhaul and had rewritten their chat client. Initial testing shows that as of Feb. 2019, the delay feature seems to work at least within Chrome (within the very limited amount of testing I have had the chance to be able to so far) — This allows you to configure a chat delay in your web browser. If it wasn’t obvious from the name: What “Artificial Delay” means is that after anyone else sends a message to a chat room you are in: your browser will wait “X seconds” before actually showing you the new chat message — the delay has nothing to do with the network and is artificially added by the software in your web browser. All the other moderators in chat without a delay configured still see the message right away, And if a moderator erases the message or purges the sender (by timeout or ban): The purge/delete takes affect before the message appears on your screen. 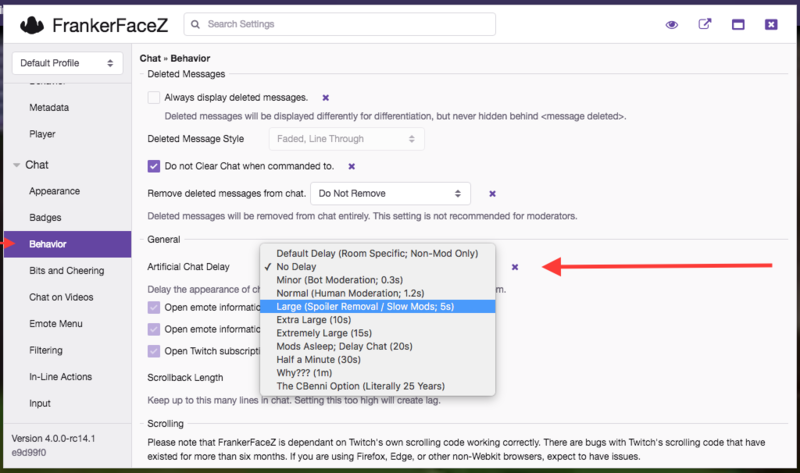 The configurable Artificial Delay is an extension of the “Non-Mod Chat Delay” that comes standard in the Twitch chat client even without FFZ — Essentially, OTHER (Non-Moderator) Users in the chat who do not have FFZ or who have FFZ set to the default instead of “No Delay” Also have an OPTIONAL client / browser-side delay – this is set by the channel owner/mods in a channel’s “Manage Moderation Settings”, even though the delay is local and has nothing to do with the chat server. The non-mod delay is a standard Twitch feature CHANNELS can use to allow broadcasters and moderators to see messages early thus prevent their audience from seeing a message deleted during the delay —- useful for offering greater protection for a sensitive audience. The FFZ Feature, on the other hand, is a slight variation of this action which allows Anyone to control their OWN personal Artificial Delay in the local web browser – even if delay would not normally apply — the person reading chat with FFZ installed in the browser decides what their own delay is — instead of obeying the channel setting. Here is a screenshot showing the Twitch stock setting: That is not really the option we are interested in — since we are actually using FFZ to Locally Override that setting for ourself only. (1) Some Jimmy Jart tries posting a spoiler in the channel — it comes in just like any normal chat message. (2) Your web browser, Or the browser(s) of the person(s) to be protected are configured with FrankerFaceZ installed, and the FFZ chat delay options shown below — Artifical Chat Delay holds the message X seconds before actually showing it to you — The user(s) to be protected from spoilers have all set their “X” delay to a high value, such as 10, 20, 30, or 60 seconds. Channel moderators and “helpers” designated to be helpers or protectors set the X delay in their own client to 0 (No Delay). And the Non-Mod delay of the room itself is configured to a value somewhere in the middle – to offer some protection for general viewers. (3) Channel moderators and helpers have X seconds of head start time to read any incoming spoiler message, understand it is a spoiler message, and react by a moderator deleting the message or applying a ban/timeout —- If the protected chatter is using a read delay of 15 or more seconds, that’s plenty enough time for other volunteers to call out an issue and get it handled, either way: an offending message is immediately deleted when moderated out — Hopefully long before X seconds elapses. (4a) If not, then the messages all appear normally after X seconds. (4b) If the channel moderators were fast enough to act before the delay window ends, and chose to delete, then the offending chat message is not even shown at all. Instead of the actual spoiler content being shown; Alternatively, depending on other settings within FFZ Control Center, the message may instead appear to the protected user as “<message deleted>”, or may be chosen to be always shown faded/crossed-out. CAVEAT:  The delay setting applies to all channels you join this browser to (until you change it). When set on the active FFZ User Profile (Default or Mod Profile), so be careful about that (Make sure to undo this later by changing it back to `No Delay’ when finished). Furthermore…. Messages from moderators (and modlog actions) seem to appear without delay, therefore: with Artificial Chat Delay: The non-delayed messages may appear early in an order different from the order that messages were sent in; However, the delayed chat messages seem to appear in the correct order. Step 1. Make sure the FrankerFaceZ Addon is installed, fully updated, and running in the browser — How to accomplish that is out of the scope of discussion here. ACCESS Chat > Behavior (Caution: NOT Channel > Behavior) To apply your desired delay value. Moderators should select “No Delay” for their own clients. 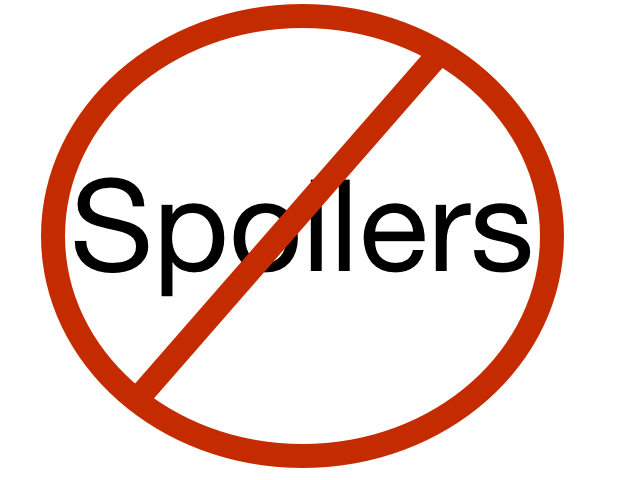 And users to be protected from spoilers should pick the desired delay value. Using two browsers: Delayed chat to dashboard. “Evil” message through safari. And a non-delayed Chatty client to delete the “bad” message, which never shows up in the dashboard. Test run… Note, this video has been slowed down; the whole sequence was about 15 seconds. Further real-world testing I would suggest is with a spammy channel: FFZ is technically still beta software, so who knows about potential performance (or other) bugs.